India needs advocate for all immigrants, not just those who arrive on H1Bs. Last week in the United States, a white American navy veteran, Adam W Purinton, shot and killed 32-year-old software engineer Srinivas Kuchibhotla, originally from Hyderbad. Purinton reportedly accused Kuchibothla and his friend Alok Madasani — also an Indian immigrant — of being undocumented. Witnesses report that Purinton yelled, “Get out of my country!” while shooting Kuchibhotla, his friend, and a White bystander who tried to intervene.Based on these circumstances, American authorities are considering classifying this act as a hate crime. The murder jolted Indians into awareness about the grim realities of life under President Donald Trump. It is undeniable that Trump’s rhetoric has enabled a culture of xenophobia and violence that was unthinkable under the previous administration. However, it is also true that fear has underpinned the lives of many Indian immigrants far longer than the last four months. According to a recent study by the Pew Research Center, about 500,000 undocumented Indians live in the US. Indian immigrants are the fastest growing group of undocumented immigrants in the United States. They arrive in search of financial stability, personal safety, and desperation with the lack of opportunities afforded to them in India. After they reach America, many live in substandard housing, work for less than minimum wage, and exist under the constant threat of deportation. This threat has only intensified during the short time that Trump has been in office. Last week, the Trump administration deployed a series of immigration raids which resulted in over 600 arrests. While it is unclear whether these were a deviation from routine law enforcement activities begun during Obama’s presidency, they are some of the first to be conducted under a new set of priorities. While previously Immigrations and Customs Enforcement (ICE) focused undocumented immigrants who had perpetrated violent crimes, a recently signed executive order broadened this scope to include those who have committed minor crimes and those who have not been charged but await trial. This greatly increases the number of immigrants vulnerable to detention. The ICE raids were always designed to be frightening, occurring in the early hours of the morning, and taking family members away while children and spouses watch, helpless. However, several aspects of the latest raids appear to be calculated to exacerbate the current climate of fear. For example, a leaked memo references a plan to deploy the National Guard to identify and deport undocumented people. In New York City, rumors of the raids ran rampant in predominantly South Asian areas like Jackson Heights, rendering immigrants too anxious to leave their homes. 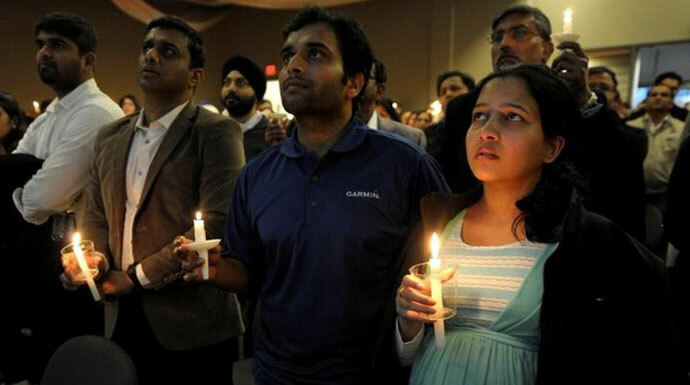 Documentation alone, however, does not guarantee safety or peace of mind for Indian immigrants. In 2015, long before Trump was elected, the FBI reported that hate crimes against Muslims in the US surged by 67 per cent. In the five days after Trump’s election alone, the Southern Poverty Law Center reports over 400 hate crimes in the US, including over 30 incidents that were explicitly Islamophobic. Considering that 10 per cent of Indian immigrants in the US are Muslim, and more than a quarter of Muslim immigrants in the US come from South Asia, the rise in anti-Muslim hate inevitably must affect Indian immigrants in the US regardless of their citizenship status. Kuchibhotla’s death is a tragedy. Nothing should minimise the gravity of his family’s and our nation’s loss. The violence he faced, however, should not be treated as an isolated incident, but a heartbreaking piece of a pattern of detrimental human rights violations against Indian immigrants who may not have shared his faith, wealth, status, or level of education. The best way to honour Kuchibhotla is to publicly condemn the anti-immigration policies of the Trump administration, and to advocate for all immigrants, not just those who arrive on H1Bs. So far, Prime Minister Narendra Modi has focused his diplomatic efforts on the future of the H1B visa programme, which has traditionally been an avenue of migration mostly reserved for middle class, educated Indians. At the time of writing this, the Indian government has made no public statements on behalf of undocumented Indians — the majority of whom are working class — or Muslims. Furthermore, the Indian government has yet to condemn Trump’s Muslim ban, despite the fact that India is home to the second-largest Muslim population in the world. Leaders of countries such as France, Germany, Turkey, and the UK, and agencies such as the United Nations Refugee Agency and the International Organization for Migration, spoke out against Trump’s policies almost immediately. India’s voice remains conspicuously absent. As the world’s largest democracy, a significant player in the global economy and a geographically strategic pocket of stability in an unstable region, India’s soft power should not be underestimated. Condemning America’s new approach to immigration is not only consistent with our nation’s secular, nonviolent values, but also an opportunity to positively influence an increasingly xenophobic world. Above all, though, India’s failure to denounce Trump’s xenophobic hate-mongering is a betrayal of our history and foundations. It is also a disappointment to Indians living not only in America, but all over the world — including those whose deaths, deportations and suffering do not make international headlines. Mathangi Subramanian is an award-winning author and scholar who writes about issues of immigration and education.